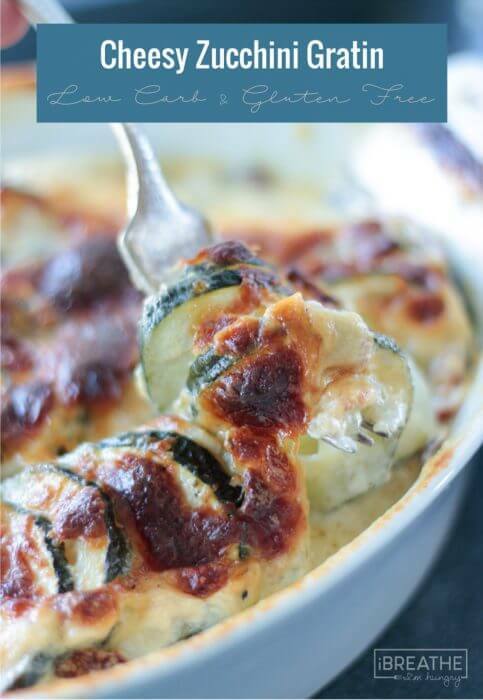 This Easy Cheesy Keto Zucchini Gratin has become a staple in our house! 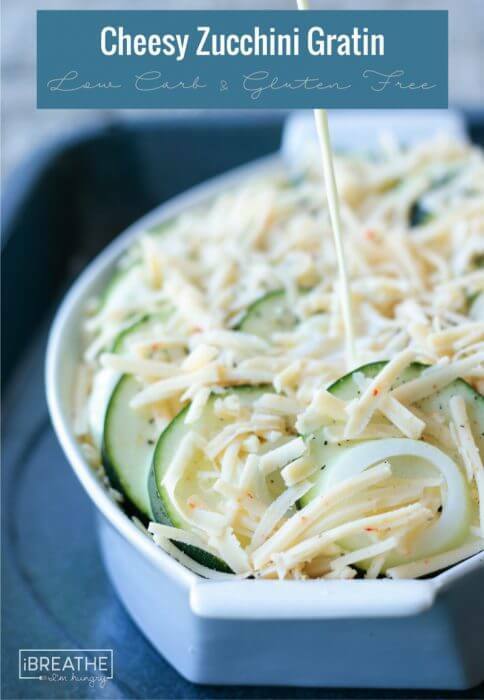 It’s cheesy and creamy, super easy to throw together, and the perfect low carb side dish for your keto diet! Don’t get me wrong, Mr. Hungry does more than his fair share around the house, but cooking is mostly my department. And that would be fine – except he hates 90% or more of the things I love to eat on keto. 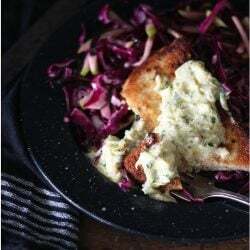 So while I would be perfectly happy throwing some Better than Potatoes Cheesy Cauliflower Puree in a bowl for myself and calling it dinner (which I do a lot) – he won’t touch anything that has cauliflower in it with a 10 foot pole. Or broccoli, or spinach, or pretty much any vegetable that isn’t potatoes. 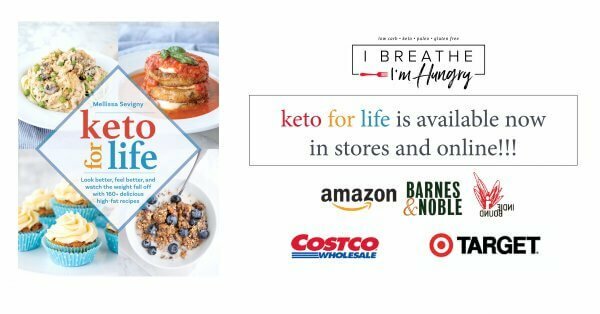 Which makes it really hard to make keto friendly meals that he’ll actually eat. Zucchini is on the list of less offensive but not his favorite (i.e. “I don’t love it, but it doesn’t make me want to kill myself”) vegetables that I sometimes sneak in there. Those of you with picky eaters in the family know the struggle. Whether it’s finicky kids or veggie phobic spouses, making something that everybody will eat and like is a challenge sometimes. I find that to be true of keto side dishes most of all. Who doesn’t love a good steak or roasted chicken? But coming up with tasty low carb veggie side dishes that go with those main courses night after night can be a problem. 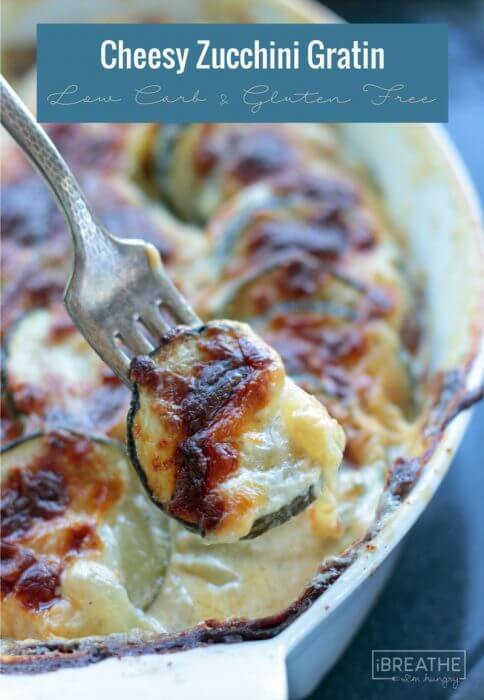 So when this Easy Cheesy Keto Zucchini Gratin went down and everybody liked it – I mentally high fived myself and made it a regular thing. 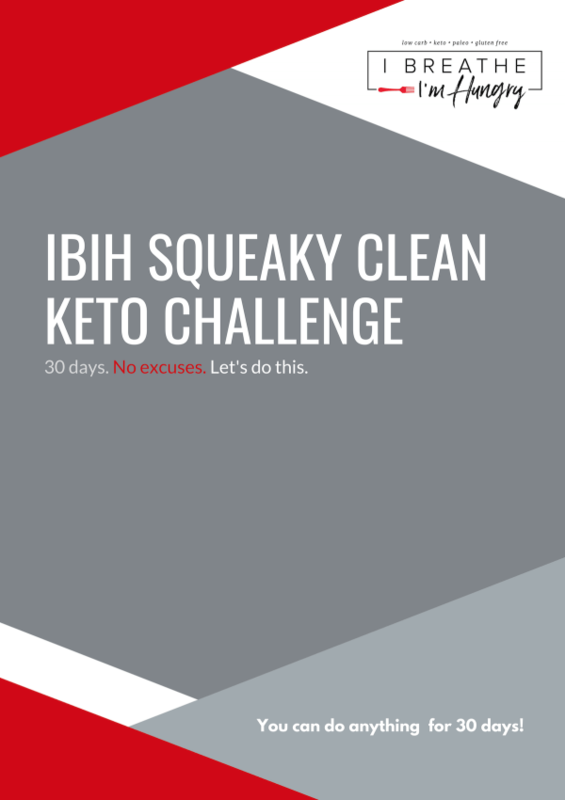 You’re going to want to do the same when you try it! I used pepper jack cheese the first few times and we love the mild heat that it adds – but if you prefer cheddar I tried that too and it’s also delicious. 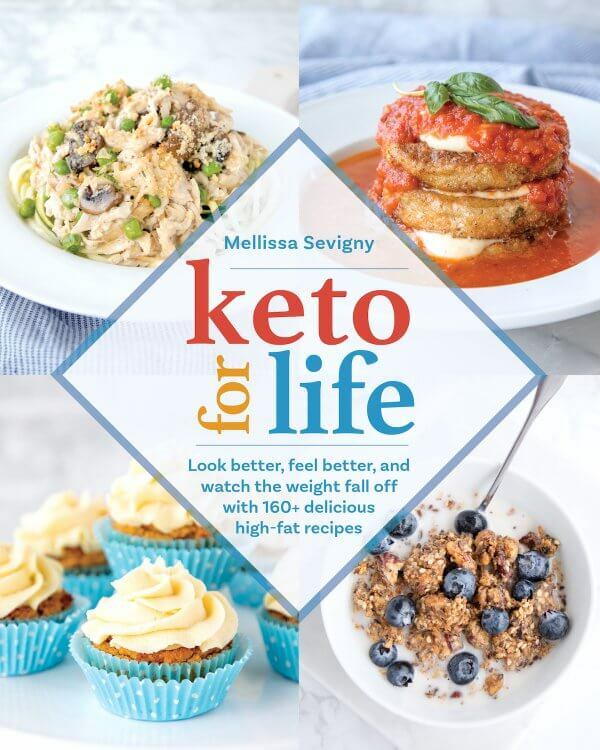 To get more fantastic keto recipes, download my super bundle of FIVE e-books for just $19.99! I just made it and had it with my dinner and it was divine! Loads more for the next few days yum! What other veggies would you consider aside from zucchini? I love it but not a household fave by any means. Gorgeous! Great replacement for potato gratin! I have just found your recipe and as I live alone I usually try and make things that I can also freeze. Do htis recipe freeze well? Thanks for a great little recipe! Easy and delicious! Will be making this regularly. Loved this! I didn’t have xanathan gum so I used the same quantity of guar gum and it came out great. Next time I might use just a pinch more to make the sauce a little thicker, but the consistency was still very good. I made sure to choose very firm zucchini and didn’t have any issues with this being watery. Thanks for the easy recipe! This looks so good! I love zucchini 😋 I’m new to low-carb and don’t have any xanthyn gum. Is there a substitute or can it be omitted? You don’t need it. I’ve made this 20 times at least and never used it. Delicious. Such a great dish that can be turned into a whole meal! I simply did 1.5x the liquid part of the recipe and added 1 1/3 lb (Costco) package of cooked ground beef. I made sure to sweat the zucchini and onion, which lowered the final cook time to 30 minutes. I layered the ground beef right over the onion layers and added parmesan cheese with the cheddar. I baked it in a greased 9×13 dish for 30 minutes. Thanks for the delicious recipe!!! Sounds delicious, thanks for sharing your version with us! I never do reviews, but I was so pleasantly surprised at how delicious this was I had to share! I highly recommend. I will definitely make this again and again. I followed the recipe as stated. Oh my goodness! This was absolutely delicious ! Made it when we had family come in town last minute for the day ! I subbed out pepper jack for gruyere cheeses. I also added 3/4 cup heavy cream. Baked it for the full 45 minutes then let it sit in turned off oven for additional 20. Came out perfect ! It was a huge hit with our guests who tend to turn their heads at alternative side dishes from traditional . One happened to be a 78 yr old man that has NEVER tasted zucchini because “it looked funny “. He went back for seconds 👍🏻 Although he claimed he was only eating it because in the south you eat whatever is cooked for you when you’re a guest 😂. Either way, it is now in our regular rotation and thank you for such a great recipe ! Made this last night with zucchini from my garden, and substituted for the garlic powder 3 cloves of pressed fresh garlic from this year’s crop. Also forgot all about the onion, so have to add that next time. The result was terrific, but my fresh garlic must be way stronger than your powdered… I didn’t have to worry about vampires last night at all!! Next time, 2 cloves, or maybe only 1. Might also try adding some fresh herbs in with it, too, or diced jalapenos. I, too, had excess moisture issues, even after baking it an extra 20 minutes, but just served it with a slotted spoon and it was fine. This was amazing!!! So delicious, I almost couldn’t stop eating it! It was perfect exactly the way it was written. Thanks! I don’t have heavy whipping cream today…but I have canned coconut milk. What do you think of subbing that? Otherwise I will save this recipe for another day! Personally I think the flavor will be weird since I never combine coconut milk with cheese. But maybe it can work, let us know if you try it. Question- doyou peel the zucchini before making? Or leave peel on?? Thanks! Even my picky teenage daughter liked this. My teenage son got thirds and my husband asked if I would make it again. Sounds like a winner for our family!! I made this today and it is SO GOOD! Like better than I thought it would be. I made it exactly as written except I salted the sliced zukes and left them on paper towels, changing out a few times over a few hours. My garlic powder clumped up on me in the microwave, not sure why. So we’re going on vacation next week and since we’re driving I had this amazing idea to cook/prepare everything ahead of time and freeze it so there’s no huge grocery run or working with a condo’s limited kitchen supplies. I really want to make this and freeze it and I can’t decide if I should bake it, cool it then freeze it or freeze it unbaked. Do you have any thoughts on that?? Thank you for a wonderful recipe!! This was absolutely amazing!! I made it exactly as written. Not watery at all. Very delish!! #keeper!! This is a solid recipe. :-) It was easy and fast to make and came out delicious. My one critique is that like many other reviewers, there was so. much. water. I tried to head it off by sweating the veggies before baking, as others suggested but there was still a significant amount of water when it came out of the oven, even after giving it an extra 10 minutes of cooking time. That said, although this was a bit soupy the first night, it firmed up in the refrigerator overnight and we enjoyed the leftovers for several days. 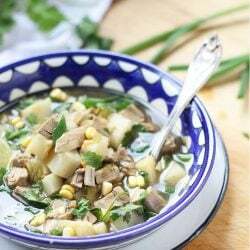 It is definitely one of those dishes that gets better later (which would make it perfect as a Thanksgiving side dish, since Thanksgiving is all about the leftovers. :-) Thanks for a great recipe! 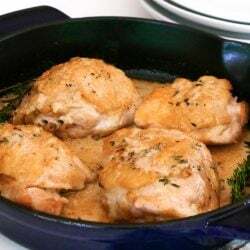 I am histamine intolerant and there are few things that taste as indulgent as this fabulous recipe. Important note: due to histamine intolerance I substituted the Pepper Jack cheese for plain shredded mozzarella! This dish was so yummy and satisfying. Thank you for posting it! This was very tasty and easy to make. The zucchini was soft and the cheese was crispy. 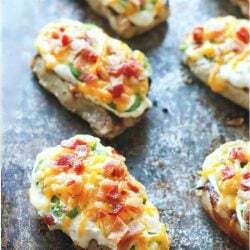 Pepper jack cheese usually gives a good flavor and the family loved it. I’ll be making it again. I made this tonight, turned out perfect. For the commenters saying it turned out watery, try sweating your onions and zucchini first. I sweat all veggies before making a casserole with them. How do you sweat veggies? I made this for Christmas Eve dinner, and it was FANTASTIC! I layered the veggies and cheese a couple hours ahead and poured in the cream mixture just before baking. I was worried I might have too much liquid due to the prelayering, so I cooked it a little longer and at a higher temp than recommended and it was PERFECT. Thank you for a great husband (and kid) pleasing recipe! This was absolutely delicious! Blew my main dish out of the water. I did equal parts sharp cheddar, pepper jack and Monterrey jack and it was SO good. I think the only other thing I added was a pinch of cayenne for some extra kick. I salted the zucchini slices beforehand and blotted them as much as I could with paper towels before placing them in the dish. I also cooked it about 10-15 minutes longer than the recipe says. It was slightly watery at the bottom but the onions flavored the liquid so well that we wanted to slurp up the extra liquid! Thank you for this amazing recipe! I am always looking for low-carb sides as I get sick of side salads and this will be a staple! So glad it was a hit Kayleigh!!! Ditto! So tired of salads. This was amazing. I halved the recipe because I only had 2 sad little zucchinis, and I reduced the baking time by ten minutes. It was perfect. It wasn’t soggy or raw. It was perfectly cooked zucchini and delish browned cheese. And the onion flavor was divine! I think I will add cayenne next time like you said, for that extra little kick. I loved it! Another winning recipe! I made this last night, I used about 2.5 medium zucchini and followed the recipe, I had no excess liquid. I ate seconds and put it away for my own good! My garden squash was a bust last year but I will try again next spring and hope for a big harvest! Just thought you should know how good this is! I made a version of this without onion and included bacon and it was amazing. No issues with texture or moisture. I am always afraid to try internet recipes but this was very good. And I hate zucchini! Not any . Thank you for sharing! Would it be possible to cook this in a crockpot? If so how long do you think it would take? I just made this for my husband and I to accompany a nice piece of steak. It was so delicious! I had read the reviews saying that there was too much liquid so I did end up cooking it about 20 minutes longer than the recipe states. There was just a little liquid and it was completely wonderful. We will have this again and my designs on the leftovers include breakfast. I am sooooo sick of bacon and eggs!! Thanks for your good work developing these recipes for us. Oh em gee! This was amazing! I made it to go alongside baked chicken and my family all agreed that this could have been the main dish. I didn’t have pepper jack, but I did have sharp cheddar, mozzarella, and shredded parmesan. I mixed them all together on each layer. Followed everything else to a T. Absolutely delicious. Thank you! Looks so good! Will try with cheddar so my kids that wont eat a little spice will try. Quick question though, how many zucchini make 4 cups?? It depends on the zucchini size. 2 average size would probably get you there but I’d get three just in case. Made this today. Absolutely delicious! Thank you for sharing! Wow this was good!! Really really great. I enjoyed the texture and I baked it at 400 degrees for 55 mins to get all the moisture out. 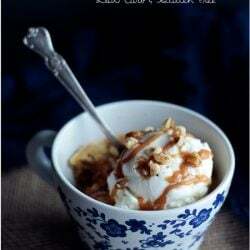 Excellent recipe that I will be comiting to memory and adding to my repatoir. I just made this. It was delicious. My husband actually had not seconds, but thirds! This recipe is one of my go to favorites now! I’ve fine multiple variations with different cheeses and I have even modified it for a crockpot and added ground pork sausage for a Potluck. It was definitely the favorite by far! The leftovers of this are delicious in scrambled eggs! Zucchini have so much water in them. I wonder if it would work to partially dehydrate the slices before assembling this casserole so it won’t be so watery. I finally tried this recipe. It was delicious! I was worried about comments saying it might be watery so I did put the zucchini slices in the dehydrated for a bit on the highest setting. After removing some of the moisture I assembled as directed. It was thick and gooey with cheese, not the least bit watery. Definitely will be making it again. Do you know if this freezes well and/or keeps for more than a day? Like can I meal prep.it basically and then nuke it or would it be yucky? How pretty that is, and by the end of summer I welcome any recipe to help me through the many zucchini that I always have. anything with cheese is a plus for me. looks so good. I wrote a comment earlier today but I don’t see it! I said I was making it tonight for dinner and I did!!! A real hit with both my husband and me. It will be a regular. My onion wasn’t real sweet, actually kind of strong so I cut some bok choy, the rib part, to add some sweetness and it worked really well!! It paired great with my salmon patties. Thank you! As I had said in earlier post, neither me or my husband are picky…we like most vegetables, there aren’t a lot of low carb sides out there!!! Your Green Chicken Enchilada Cauliflower Casserole is one that we love and I make it a lot. I make it without the chicken for a side and with the chicken for the main dish!!! Glad this turned out for you Marilyn, I love the idea of the bok ribs! I’m making this tonight. Neither my husband nor I are picky eaters, we both like most anything. But….having said that, I still run out of side dish options! I’m a zucchini lover so I’m really excited to try this dish. Thank you Melissa fo being so good at what you do. You are a life saver! I’m serving this with salmon cakes…..I hope that is a good pairing! I made this last night. I used the ingredients listed but changed the way it was made. I sliced the zucchini thin on a mandolin and sauteed the zucchini and onions in the butter until they were soft. Then I combined that with the remaining ingredients in a casserole dish. I just mixed everything together rather than layering it. Baked at 350 for about 30 minutes until the top was browned. It turned out great! DH loved it! Do you think that you could substitute other vegetables- for example, broccoli/cauliflower? I guess since they have less moisture, they should be steamed or boiled beforehand?? It’s hard to find Zucchini in German stores right now because it’s so out of season. Thanks! The principal difference is what’s on top of the dish. A gratin (coming from the French word for “grated”) usually has a topping of bread crumbs or sometimes cheese, which browns at the final stage of cooking. A scalloped dish does not have such a topping. Looks great! Always looking for new zucchini recipes. Can’t wait to try next week! I made this last night and I had a lot of extra moisture – maybe a cup or so that didn’t reduce. Did I do something wrong? It smelled and tasted good, but watery. Thx! It’s possible that your zucchini had more moisture in it than mine I suppose – hard to say what the variables could have been! A cup of extra moisture seems like an awful lot though? I made this last night and had similar results – tasty but watery. I even turned on my convection fan to try to “dry” it out. (Maybe that made it worse?) But I enjoyed the flavor enough that I may experiment with the recipe another time. Any suggestions for dealing with the extra moisture? Xanthum gum? An egg in the sauce? Made this for dinner tonight and the flavor was wonderful enough to make again, but mine came out very runny, which I was afraid of because of the water content in the zucchini. My cheese also came out lumpy. Any suggestions on what I did wrong or what I could do to fix it? My hubby and I both loved it but the watery lumpy consistency was at least unattractive. Thanks for the help! Not sure what would have caused both lumpy cheese and a watery consistency other than undercooking it? Did you use pepper jack or a different cheese? The cheese should have completely melted into your sauce, which would have thickened the sauce and kept it from being watery? If you followed the recipe exactly as written then I’m stumped – sorry! Definitely going to try. Mu family loves zucchini. Just made this for the first time for today’s lunch. YUMMY! Even hubby (who isn’t low carb) got seconds!!! Thanks so much! I’m new to your site and can’t wait to try more recipes. Just made this and it was delicious! I too love the mild heat from the pepper jack cheese and of course I love zucchini’s so this was a winner in my house. Thanks Melissa! Have you thought about adding bacon to this? Mmmmmm I’m going to make it right now. I am excited. I am wondering also if you could add shredded chicken and make it a full meal? Thank you for this recipe! Is this recipe for 6 or for 9 servings? My brain may just not be working after a full day of work but the nutrition facts say they are for a 3×3 square. 9 servings. You’ll cut at the 3 inch mark in each direction getting 9 squares. Thanks! The serving size at the beginning still says 6, that was throwing me off. Really? Sorry about that, I’ll go look and fix it! I am so addicted to your cheesy cauliflower puree! I make it every week. I can’t wait to try this one. You really do have the best recipes! Thank you! I made this tonight but had to do a small sub. I did not have pepperjack cheese so I used fontina and some crushed red pepper flakes. It was amazing! Perfect and cheesy with a tiny bit of heat. I’ve already dished up a serving for lunch tomorrow! I made this to go with a grilled ribeye last night. Quick, easy and delicious. I used plain monterey jack and halved the recipe as it was just my husband and me. No leftovers. This recipe sounds amazing. 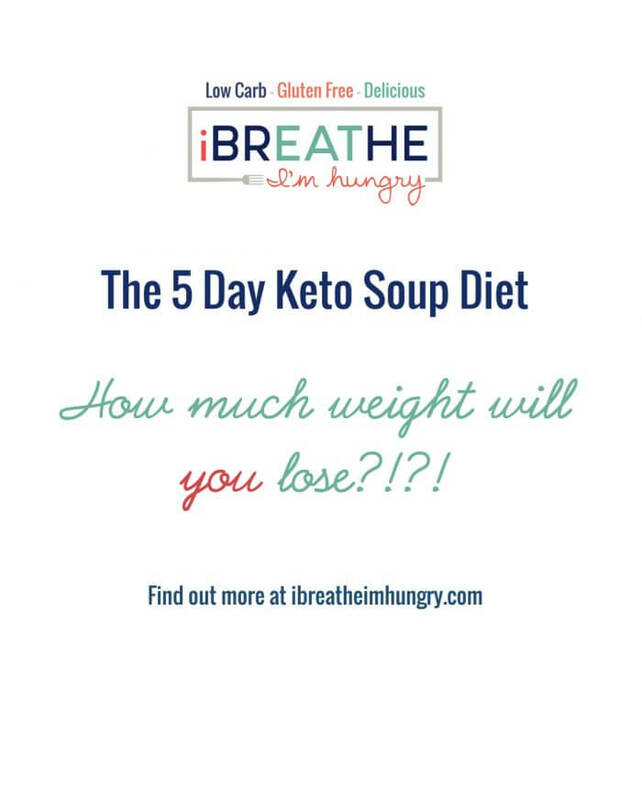 I am new to the keto / low carb eating plan. I am making the Cream Cheese Pancakes this morning! This recipe sounds amazing. I can’t wait to make it. 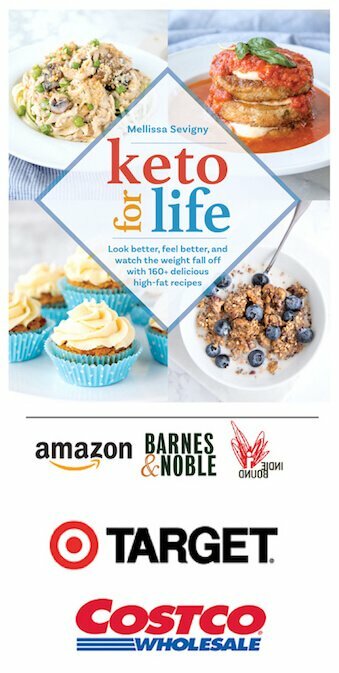 I’m new to the keto way of eating . I am making cream cheese pancakes this morning! Yummy! Just ate this for supper last night with baked salmon and cole slaw. So simple and yet so scrumptious! I could eat it this way every week. Now I want to try it with other cheeses too. Thanks for letting me know you liked it Paulette!!! Incredible sight. Time to jump back into “lose pounds” mode. I always find myself coming back to this site to keep my program intersting. 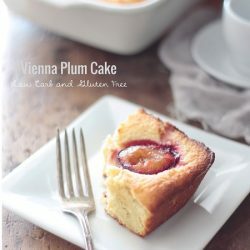 Looks incredibly yummy… and so easy to make! Zucchini has been a favorite of mine since I dicsovered zoodles; will definitely be makin’ me some of this tomorrow! :) Thank You! Wow, this sounds fabulous! I am sure once I try it, I’ll be making it often too. Thanks for the great recipe! Mmm..this look perfect. I’ll be trying it! Awesome! Let us know if you liked it as much as we did! Can I ask does this taste like potato gratin? I don’t like zucchini, but if it doesn’t taste like it, maybe this will work. 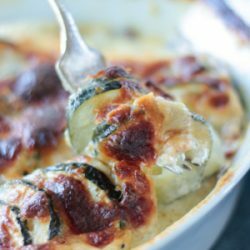 I don’t know that it tastes exactly like potato gratin, but especially with the pepper jack cheese the zucchini takes on the flavor of the sauce and you don’t really taste it. I guess it depends on how much you don’t like zucchini – we loved this but we don’t hate zucchini either. If you try it let me know if it passes the test ha ha! Will do!!!!! Thanks for answering. Ahhhh! Looks so delicious! Going to make this tomorrow! Let us know how it turned out Anne! Will this one work reheated during the week, if I made a large batch on the weekends, or do you think it would end up soggy? I should have mentioned in the post that this reheats SO WELL that I enjoyed it just as much or more the next few days that I had it for lunch! It just keeps reducing and getting thicker, so it’s really really good reheated! This looks delicious! I’m going to have to make it sometime soon since I think my hubby will enjoy it too :) Thanks! I hope he likes it as much as mine did! Hope it’s a hit Tiffany! Hi. I have a very picky husband as well when it comes to vegetables and keto. He likes potatoes (baked or lumpy mashed) and green beans with everything and has a problem with mushy textures (so that makes mashed cauliflower a no-go) I love the idea of making this I just worry whether or not he will eat it because of his texture issues. Lol. Does this come out super soft or are the zucchini still a little firm? I think at 45 minutes the zucchini aren’t totally mushy, but if he likes it firmer you can always reduce the cooking time a bit – my only worry is that the sauce won’t reduce all the way. Mr. Hungry has texture issues too and he was fine with this. Worst case? He hates it but that means more for you! Ha ha! OMG this looks incredible! I’m obsessed with zucchini! Hopefully I can find some decent zucchini at the store this week. Their quality and supply were lacking last time I looked. Can’t wait to try this. 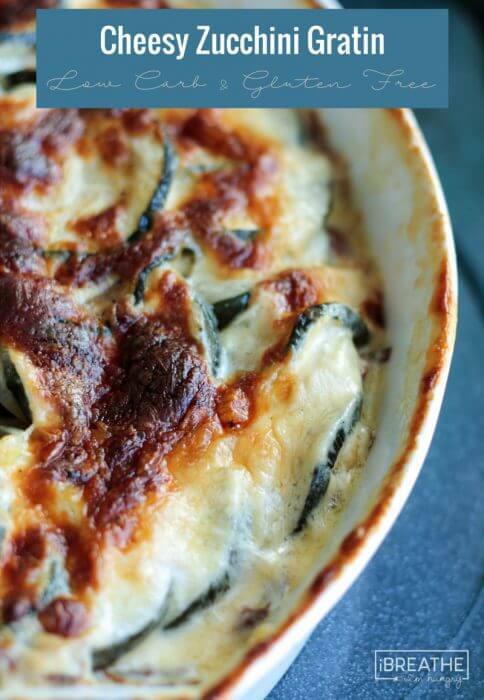 Have you thought about tackling a spaghetti squash gratin? I tried a couple versions that I found online, but they were not written specifically for a ketogenic diet and they came out kinda blech. I know you’d make something delicious. I wish! I miss spaghetti squash so much since moving to Belize – I don’t think they even know what it is here and it’s impossible to get. If I’m back in the states visiting for an extended time I’ll try though. I do have a spaghetti squash with pesto that’s good on the blog! This recipe is perfect! My husband also said he wanted to drop some pounds but he won’t touch cauliflower, Brussel sprouts, spinach, need I go on. This makes the challenge of dinner side dishes quite complicated. 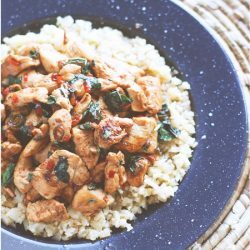 This is my go-to site for all recipe ideas because they always turn out great without the need for tweaking. Thanks for keeping me inspired. Don’t even get me started on the Brussels Sprouts Gina! Ha ha! 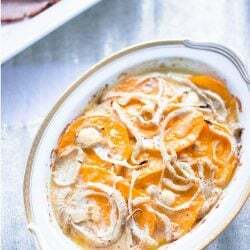 Hopefully your husband will like this gratin as much as mine did!